5. Contact, Mod Guide etc. Well, here it is, at last. Battlefront Zero. 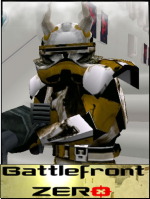 Battlefront Zero is a mod for Star Wars Battlefront 2, which basicly adds VERY MUCH new Clone Wars stuff. new weapons, new vehicles, new heroes, new sounds, new effects and new animations. 3. After installation, play till your computer crashes because of the drool coming out'f your mouth! temporarily not loaded. You can always replace them ofcourse. This should be compatible with the Conversion Pack and The Dark Times. The mod mainly focusses on fixing old bugs, polishing some models and adding a WHOLE NEW ERA with heroes, sides etc. AT-OT -- Done, but didn;t finish the animations yet. The above might be released as a seperate mod! work I've put in this, and also all other contributors. This will be my last big mod, and basicly it's the only mod I've done. Don't spam, or it won't be answered. For questions, go to GameToast. 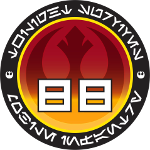 A DIVISION OF LUCASFILM ENTERTAINMENT COMPANY LTD.
Last edited by MandeRek on Sat Aug 14, 2010 10:52 am, edited 1 time in total. Wow! Its finally here! Good to see you've finally released the finished version. My only issue is the 500mb download. I don't think i'll be able to download this . Congratulations, MandeRek, on this final release of Battlefront Zer0 and all the effort you put into it to make it so. It seems like it was only yesterday that I played through the alpha. I'm glad I had the opportunity to help out and contribute in whatever way I could, whether it would be loadscreens or even a map, it was worth my time. I'm sure this version will be a blast to play through. On another note, I won't 'stop' modding completely.. I'll still be available for small fun things, like moddeling contests, or helping other people if I can. I really want to focus from big, massive content mod (BF0) to more small, real polished, refreshing maps. Besides, I'm always in for requests for friends ofcourse. I'm still hoping on a nice trailer for BF0, Revan would make one if I remember correctly, but my pc is so unbelievable laggy.. I'm already having problem playing on the highest lighting settings, so can't even think about recording. If people are in the mood.. I'ld be more than happy! Good to see it's out, bad to see the great chapter of Mande's mod is coming to a close. Looks good, man . Downloading now. It says here that the file is temporarily unavailable and I have been trying to download this the whole day. I guess I will wait until you have another mirror ready. Just played through a few maps, congrats to you and all that contributed. And I must say the ATAP looks awesome with the lighting on Kashyyyk, thanks for getting it in game. I'm having the same issue as Nihillo, but I'll be sure to give it a download as soon as I can. ^I think the file was "temporarily unavailable" because so many people were trying to download the mod at once. Anyway, I just started downloading it and I'll try it out soon. And I must say it is a shame that Endor:Base couldn't make it. The screens looked so good. I'm guessing we can post our reviews here? Oh, and can you tell me how many maps there are so I can know if I installed it right? inky wrote: I'm guessing we can post our reviews here? You can post reviews if you want, but there won't be a new release so at least I won't do anything with them.. They're always good ofcourse. FragMe! wrote: And I must say the ATAP looks awesome with the lighting on Kashyyyk, thanks for getting it in game. I had a chance to play through the mod a bit last night, and I have to say the new content really shows how far you've progressed as a modder. I still have my criticisms of some of the older content from when the mod first started out, but I recall you mentioning that you lost a lot of the source files for the original maps, so there's not really anything you could have done with them. Everything you've added more recently, however, has been of high quality. Eggman wrote: I had a chance to play through the mod a bit last night, and I have to say the new content really shows how far you've progressed as a modder. I still have my criticisms of some of the older content from when the mod first started out, but I recall you mentioning that you lost a lot of the source files for the original maps, so there's not really anything you could have done with them. Everything you've added more recently, however, has been of high quality. Thanks a lot man It's a shame I lost them, indeed the GCW is as high or sometimes even higher quality as the old content, in a very short time. But I didn't have the motivation to redo all the old content.. I played Rhen Var, Mustafar, and Starkillers Revenge last night. Rhen Var: Gameplay was good and I liked the structures. And the way the CIS starts out, it makes them look like the invaders, which their supposed to be of course. And I think it's like that in your other maps as well. Also, the map is good for sniping if you're the Republic. Mustafar: I think you or someone else mentioned that Mustafar was the best map of the mod or something like that. And I certainily agree with that. The gameplay was as near to perfect as you can get. You couldn't just rush foward by yourself. You actually needed the help of your TEAM. Imagine that. And I had to watch my step as I jumped with Yoda, more than once dying in the lava. XD So that was a challenge. And when that happened, you actually hit rock-bottom, unlike in the stock map, where you keep on falling forever. Starkiller's Revenge: This was one of the 2 stock maps if I recall, and it just gave new units to the map. So I'll start with those. The models were very well-done, for a start. They looked "visually stunning" in my opinion. And they were pretty balanced. The weapon sounds were pretty neat too. And when i played as Starkiller, my favorite thing to do was to charge up that force light power and then run into a pack of enemies and let it loose. Made me chuckle in my head every time. Might post some more later. I will. Also, I noticed on the Republic side that there was a trooper with a vibroblade. It was named an AQ-t vibroblade....Is that a reference to AQT? inky wrote: I will. Also, I noticed on the Republic side that there was a trooper with a vibroblade. It was named an AQ-t vibroblade....Is that a reference to AQT?